Introduced in 1932 and built for only that season the BS4 reflected George Brough's desire to build a machine that offered both exceptional performance and unparalleled refinement. In order to meet the latter criteria water cooling was considered necessary leading him to look at existing automotive engines as a possible power source with his eye eventually settling on the lightweight four cylinder unit produced by Austin for the ubiquitous "7". Negotiations were started with Herbert Austin to secure a supply of the engines, taken out to their maximum bore to give a displacement of 800cc and fitted with an alloy cylinder head and water pump to save weight. 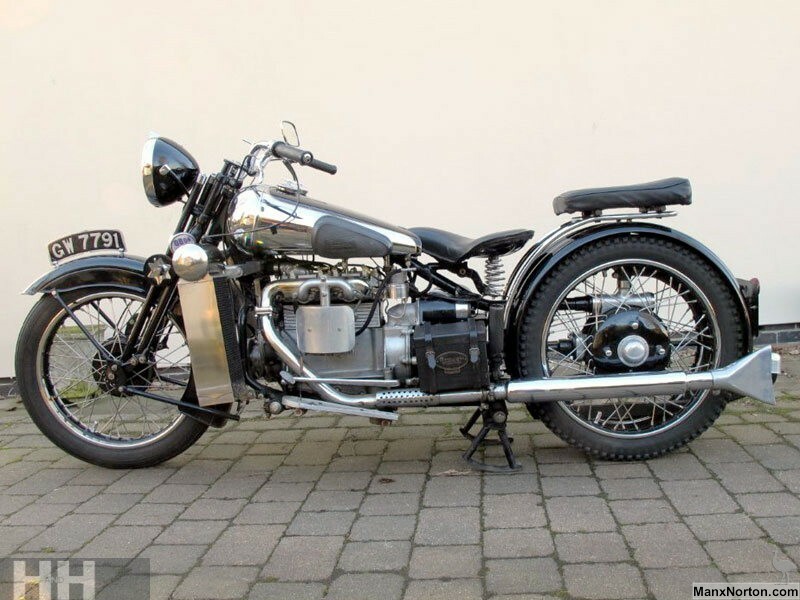 In order to utilise the Austin gearbox and transmission Brough opted to employ two rear wheels with the shaft drive, rear fork and final drive housing between them. This arrangement ensured that the weight of the power train remained central to the machine. Castle forks were employed at the front and two linked radiators were mounted on either side of the front down tube, effectively serving as legshields. Finished to the usual exceptional standard 10 examples were built during 1932, although the last one was not sold until 1934. Although primarily considered to be a sidecar machine they were and are used as a solo mount. The example offered is described as being in good condition throughout. It is fitted with a replacement engine displacing the "standard" capacity for the unit of 750cc and is accompanied by a copy of the factory build sheet, a list of previous owners and letters from them, early photographs and magazine articles referring to the model together with a Swansea V5C. Of the ten examples built, seven machines are known to survive of which three, including this example, are in complete, running order.